But in the early 20th century Fritz Haber and Carl Bosch found a way to overcome nitrogen’s reluctance to react. They could take nitrogen from the air, and bring it together with hydrogen gas in the presence of an osmium catalyst at very high pressures and temperatures. During the First World War ammonia’s other main application – as a basis for explosives – saw that ramped up to industrial scale. The Haber-Bosch process has provided fertilisers that have been crucial in feeding Earth’s growing population since then. But it comes with a downside: it requires huge amounts of energy – 2% of the entire world’s consumption – whose generation usually releases the greenhouse gas CO2. Stuart Licht’s STEP process relies upon heliostats – systems that track the sun’s movement across the sky. Many heliostats reflect sunlight at a central tower to concentrate its energy, as shown here. 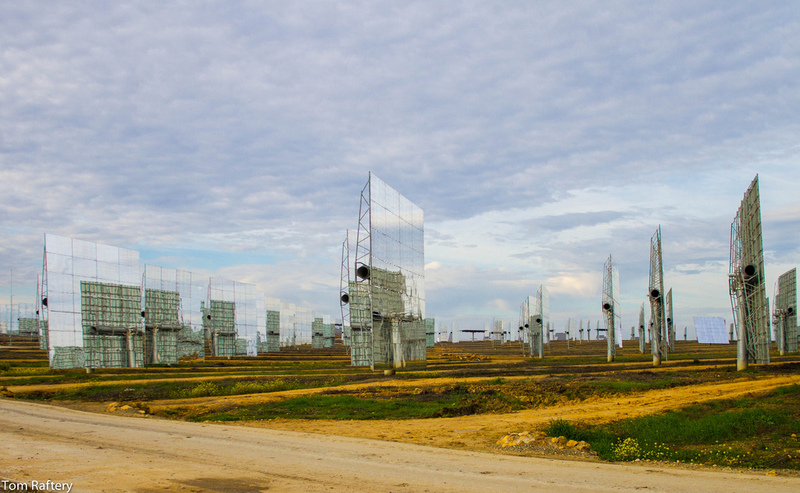 However Stuart’s team uses individual heliostats that concentrate the sun’s energy to produce both heat and electricity. Image credit: Tom Raftery used via Flickr Creative Commons licence. Stuart’s team, by contrast, has been developing a process called Solar Thermal Electrochemical Production or STEP. STEP uses electricity to reduce the temperatures and eliminate the high pressures the Haber-Bosch process exploits to get the gases to react together. And rather than reacting nitrogen and hydrogen together as gas flows, it brings them together as bubbles in a liquid. Admittedly, it’s an unfamiliar liquid: a mixture of equal parts sodium hydroxide and potassium hydroxide, heated at 200°C to make it molten. By bubbling steam through this molten liquid and passing electricity through it, STEP breaks the steam into hydrogen and oxygen. Like the Haber-Bosch catalyst, iron nanoparticles included in the mixture help the resulting hydrogen react with nitrogen from air bubbled through the molten liquid. If powered by mains electricity, the process uses just two-thirds of the energy of the Haber process. But that’s where the ‘Solar Thermal’ part of STEP comes in. Stuart’s team has built systems that use solar power to generate both heat and electricity, which could make STEP ammonia emission-free. The small ‘heliostat’ solar systems that the George Washington University use also embody another kind of promise. 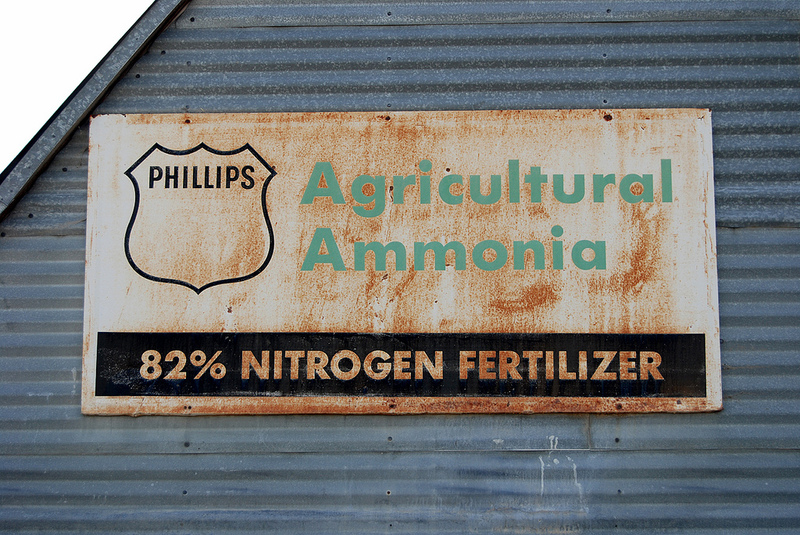 If STEP ammonia needs only a heliostat plus air, sunlight and water, it could provide the beginnings of local fertiliser factories in less developed countries. That potential led SciDev.Net – a website looking at science’s role in development – to ask me to do another article on the technology for them. My editor Josh understandably wanted to know when such a wonderful-sounding invention could be deployed. 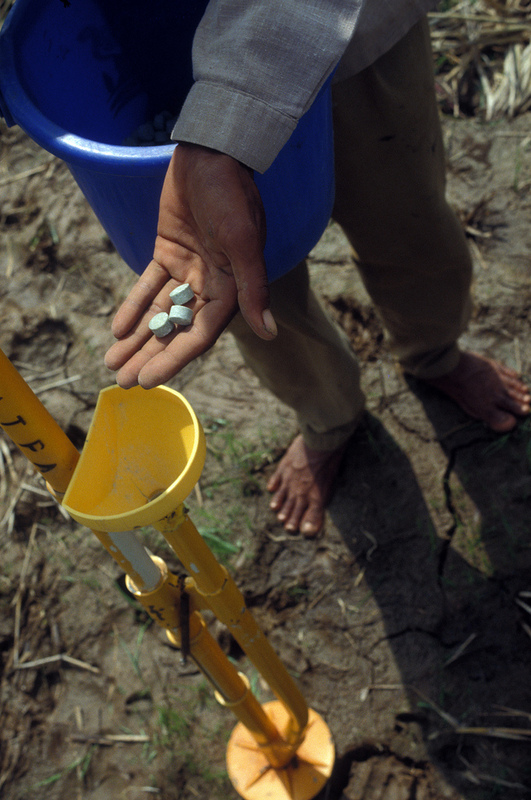 A farmer appyling fertilizer tablets on a rice field. Cheaper, cleaner, more readily available nitrogen fertilisers would be welcome, but must be used carefully. Image credit International Rice Research Institute, used via Flickr Creative Commons licence. While I respect the fact that many scientists prefer to focus on their research than trying to go into business, this immediately lowered my expectations of STEP ammonia. That was reinforced when another of my interviewees, Paul Makepeace, a fertiliser specialist at the International Fertilizer Development Center in Nairobi, Kenya warned ‘it seems it has a long way to go between now and commercialisation’. For me this is a ‘they promised us jetpacks’ moment. We love new inventions. That’s reflected in the news – including the kind of stories I write – and popular culture, like the stories of futures where jetpacks are a real mode of transport. We remember them and expect them to become reality, without considering the practical barriers, like whether anyone’s actually going to build a factory to produce them in large amounts. Can the STEP process fulfil its potential? That’s a question I can’t answer, but what I do know is that it’s not the only new electrically-powered route to make ammonia. Paul underlined that a company called NHThree in Richland, Washington, has developed its own ‘electrolytic’ approach. That requires grid power, but claims to use 30% less energy than the Haber process, and if powered by renewable energy could eliminate ammonia-production linked greenhouse gas emissions. Most importantly, NHThree is already building a plant that exploits its technology in Bolivia. Shifting one of the chemical pillars supporting modern society to production methods that don’t emit greenhouse gases would clearly be a good thing. But even then, more widespread fertiliser use could lead to more problems as my Twitter friend Joe Turner has pointed out. While nitrogen fertiliser can help us feed the world’s growing population, it is also one of the main sources of the powerful greenhouse gas nitrous oxide (N2O), also known as laughing gas. As Eric Davidson, executive director at the Woods Hole Research Center in Falmouth, Massachusetts, told me in 2012, more efficient fertiliser use is therefore essential in controlling climate change. I continue to be optimistic that human resolve and ingenuity – including that of Stuart Licht and his team – will eventually bring climate change under control. But the STEP saga shows just how much ingenuity is needed. We don’t just need to invent technological fixes – they have to be ones that can be put into practice, and then used in a way that minimises unintended adverse consequences. Unfortunately, despite this blog’s title, together these needs mean the solutions to climate change are not simple. Nitrous oxide (N2O) is an important human-emitted greenhouse gas. This graph is figure 1 in the most recent IPCC ‘Summary for Policymakers’ climate change report. 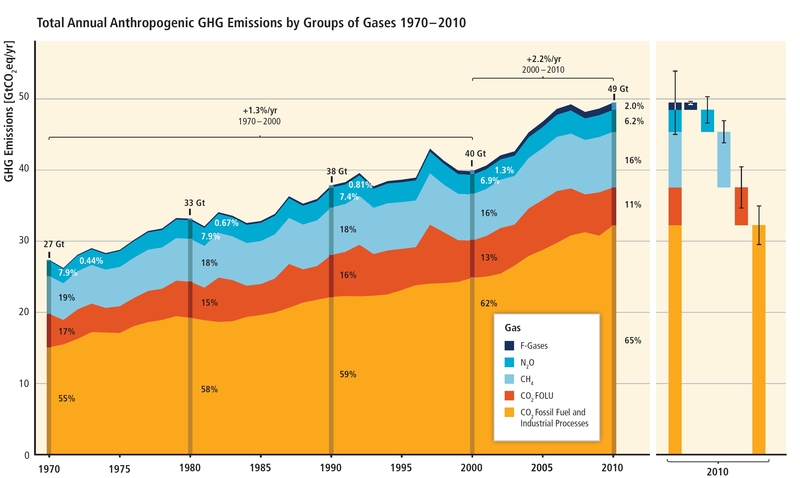 It shows total annual human caused (anthropogenic) greenhouse gas (GHG) emissions measured in units equivalent to billions of tonnes of CO2 per year (GtCO2eq/yr) by groups of gases 1970 – 2010: CO2 from fossil fuel combustion and industrial processes; CO2 from Forestry and Other Land Use (FOLU), such as land-based CO2 emissions from forest fires, peat fires and peat decay; methane (CH4); nitrous oxide (N2O); fluorinated gases covered under the Kyoto Protocol (F-gases). At the right side of the figure GHG emissions in 2010 are shown again broken down into these components with the associated uncertainties (90 % confidence interval) indicated by the error bars. Average annual growth rate over different periods is highlighted with the brackets. Image credit IPCC. Until the world goes meat and dairy free would it not be simpler just to spread manure on the fields ? – an old custom !!! Here is another way to reduce environmental pollution.